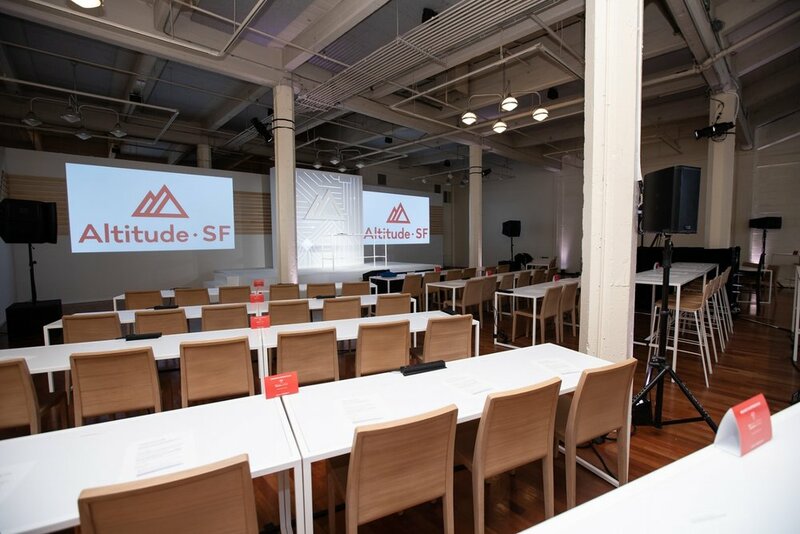 Fastly, a leading edge cloud platform that powers over 10% of the internet by accelerating and securing user experiences, held their 4th annual Altitude SF Customer Summit at Terra Gallery and we were happy to partner with the events team at Fastly and Venture Further Events to bring the vision for their stage sets to life. Inspired by Fastly’s Altitude motherboard motif and their desire to create a modern, clean, white-on-white stage set, producer Tony Irik designed the focal point of the primary stage to feature a 10’ x 10’ back-lit replication of the pattern with a halo-illuminated Altitude conference logo. The illuminated motherboard, a subtle under-the-hood nod to Fastly’s behind the scenes role helping the devops community, sat upstage of a large seamless flat wall used as a projection surface and corridor for restroom access. Raw pine accents brought a warm and natural element to clean bright look of the set. The secondary stage featured a dimensional conference logo in the same wood finish to tie both floors together. The challenge came in working in the beautiful yet unconventional space at Terra Gallery, where access is tight and the event space features various architectural obstacles. In the end, the JMP crew and the teams they worked with brought the space to life on time and on budget. Most importantly, the client was pleased and we look forward to working with them again. What good is a selfie without a great background? JMP was asked by our friends at Dominic Phillips Event Marketing to help design and fabricate twelve super colorful acrylic displays for the recent J-Pop Summit at Fort Mason Center in San Francisco. The J-POP SUMMIT, a Japanese cultural festival held every summer since 2009 in San Francisco, introduces the latest in Japanese music, fashion, film, art, games, tech-innovations, anime, food, as well as niche subcultures! In addition to the acrylic displays, JMP assisted IDEO with the rigging of their interactive Beach Ball Synth – an engaging installation that brings people together through music-making. 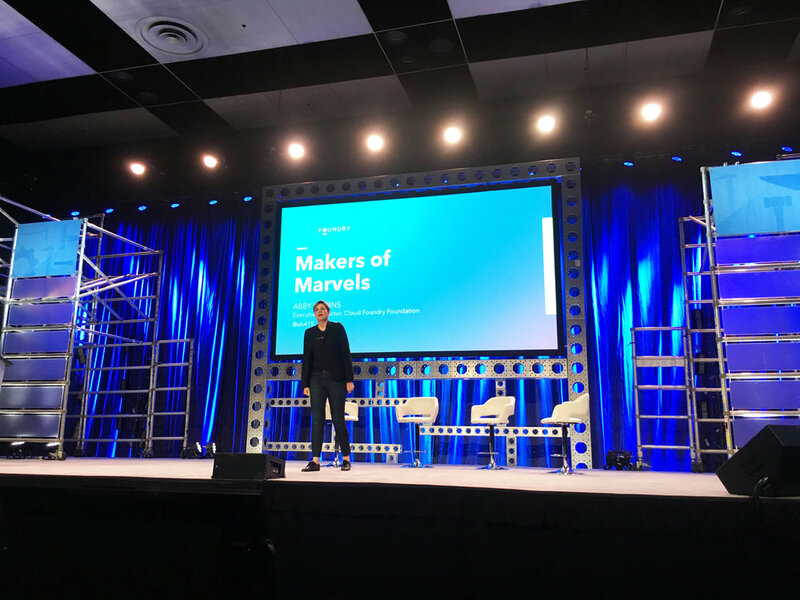 We were thrilled to work with a team of designers from global design firm IDEO, and excited to use a grid made from ModTruss that allowed the team from IDEO the flexibility to easily raise and lower the giant air filled balls for ideal positioning in the air. When client Linux Foundation approached us with a desire to use industrial materials to emphasize the functional infrastructure of their service, we developed a design that would combine traditional industrial scaffolding with modern Modtruss, visually demonstrating a link between industries of the past with the emerging industries of the future. 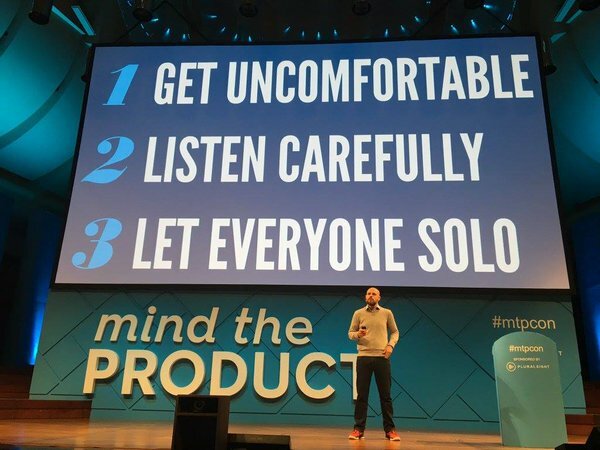 The width of the seating arrangement required a set that would have stage presence but not block visibility for the speaker or their presentation, resulting in scaffolding structures of descending heights that helped to focus attention toward center stage. Cladding these structures in frosted acrylic panels allowed for entrance tunnels that could respond to changing light effects without overpowering the overall aesthetic of the stage. 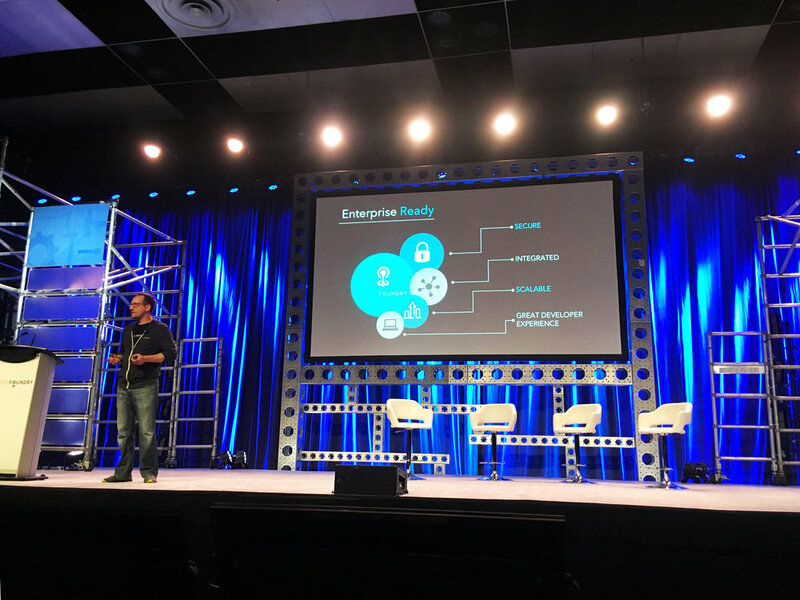 For the grand unveiling of Cisco's Spark Board, Invision Communication turned to John Murray Productions to create an automated staging effect that would be as clean and elegant as the game changing conferencing system that Cisco just delivered to the market. This all in one collaboration tool seamlessly integrates wireless presentation with digital white board and next generation video conferencing technology. Its sleek and clean design called for an equally elegant unveiling. 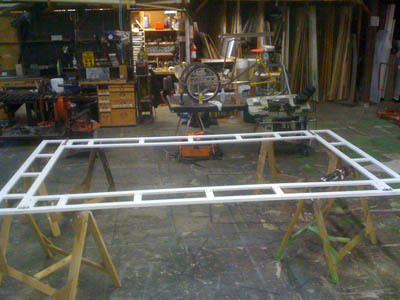 JMP designed a system to deliver the 70" Spark Board to the live audience using a scenery automation system that is normally reserved for complex theatrical productions. A low profile stage wagon carried the Spark Board down stage using a cable that was hidden in a track below the stage surface. A nearly silent zero-fleet stage winch from Creative Conners provided the muscle to drive the "dog" that pulled the wagon, and their Spike Mark software ensured that the scenery moved to the precise position for the presentation. 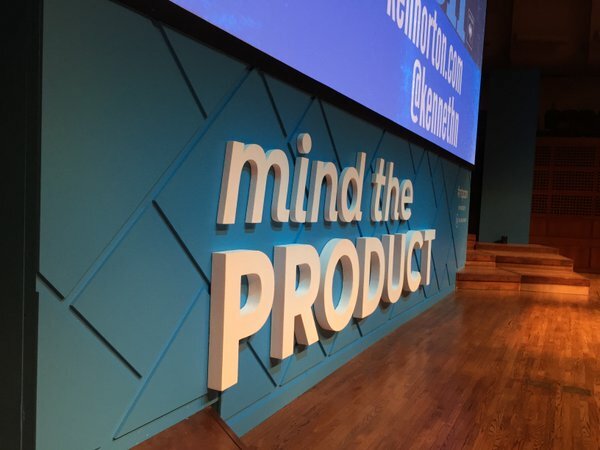 John Murray Productions was selected to provide scenic design and fabrication services for the Mind The Product conference for the second year running at Davies Symphony Hall in San Francisco. The sell out crowd at this event has doubled in so many years, they are obviously hitting a cord in the Bay Area. 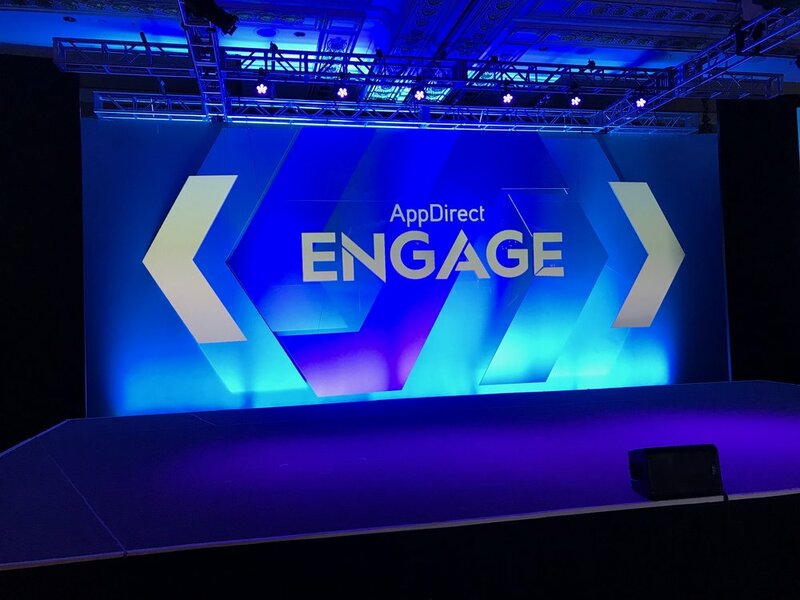 The custom set featured a dimensional logo and diamond pattern for the giant screen footer, which served to anchor the set and provide consistent and bold branding as a backdrop for all speakers. A branded lectern finished the look. We also provided conference branding for the public foyers of this beautiful and historic venue. This Fall, John Murray Productions designed and fabricated the scenic environment for Service Source's Recurring Revenue Summit, held at the Solage Resort in Calistoga. The look was inspired by the famous Napa Valley wine region where the event was held, and featured a series of wine barrels appearing to emerge from a branded 11' x 24' center stage wall. Two flanking 6' x 10.5' custom screen surrounds composed of multicolored variegated pine panels with matching stage skirt added to the polished yet rustic look. The result transformed the 50' x 70' event space into a welcoming and inspiring environment where guests could discuss and learn about the topic of recurring revenue. The mission of Curiosity Retreats is to create a unique forum where the lifelong curious can gather to explore in-depth the great questions of today. 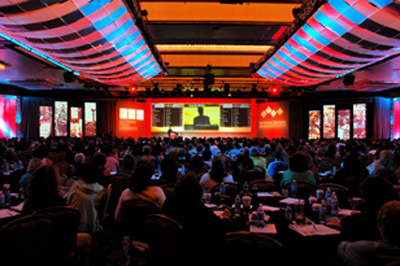 The week long seminar, held in Gateway Canyons Colorado, features noted speakers from around the globe, and JMP was proud to team with McCune Audio Visual to provide the scenic environment for this unique event. The stage set design was inspired by the look of a museum, with several objects of curiosity highlighted on the wall, with a hard surround for a 16' x 9' screen. We also contributed to the lounge area of the hotel where guests gathered to relax and discuss the speakers' message with a wall treatment featuring conference branding laid out on our 2x2 tile grid, and interactive chalk wall where guest could comment on what makes them curious. The retreat's inaugural event took place in May, but we are heading back in July to do it all again, with dates already scheduled for 2015. Click here to learn more about this fascinating event. The Host Analytics World 2014 took place at the SFO Marriott, and John Murray Productions worked with Seamless Productions to produce the set and lobby branding environment. 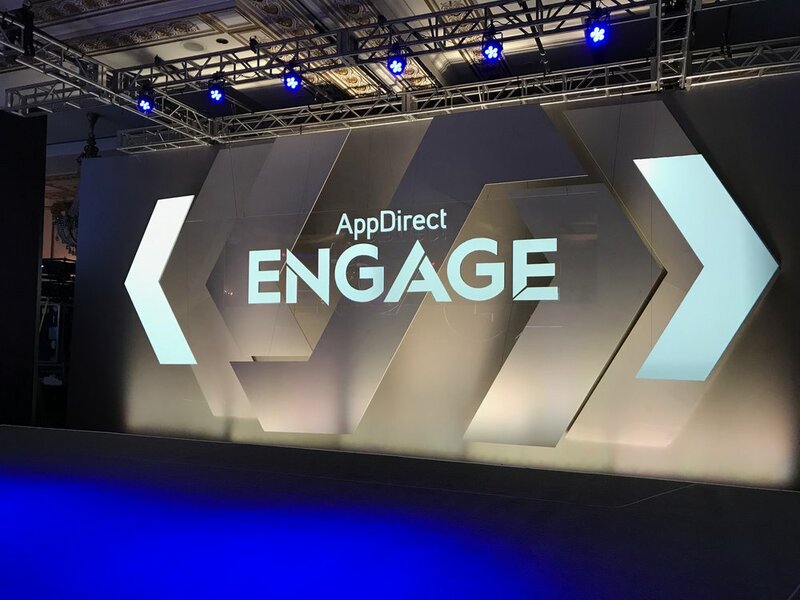 The event's theme title - engage, empower, evolve - served as the focal point of the 15' x 80' graphic set, with our glo walls flanking the 9' x 16' screens. The hotel's escalator repeated the theme with a branding treatment that covered the entire 4 sides, as well as a custom registration area, all printed on our in house, large format eco-friendly latex printer.